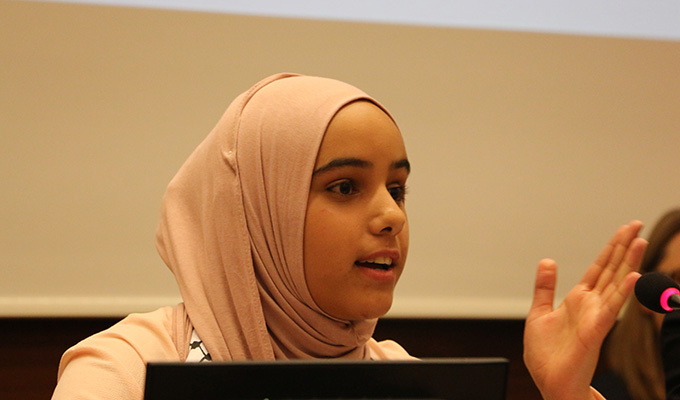 Two young representatives from SOS Children’s Villages shared their experiences as human rights defenders at the recent United Nations Day of General Discussion in Geneva, Switzerland. Agnes, 12, from SOS Children’s Villages Benin and Haneen, 15, from SOS Children’s Villages Palestine, have both taken action for child rights in their own countries and communities. The UN Day of General Discussion, organized by the UN Committee on the Rights of the Child, was on the topic “Protecting and empowering children as human rights defenders”. The event, which brought together experts and policy makers in the field of human rights as well as over 60 children and young people, empowered children to share their stories and recommendations for promoting and protecting child rights. Agnes was elected by the other children in her SOS Children’s Village to represent them at a program level, ensuring their perspectives are included in planning and discussions. Since then, she has advocated for child rights nationally by speaking to government representatives on issues such as child abuse and sexual harassment in schools. “I feel bad. I have all my rights but other children do not have the same situation. While I am well-treated and welcome in a good family others are suffering. This gave me motivation to aspire that all children receive the same treatment. 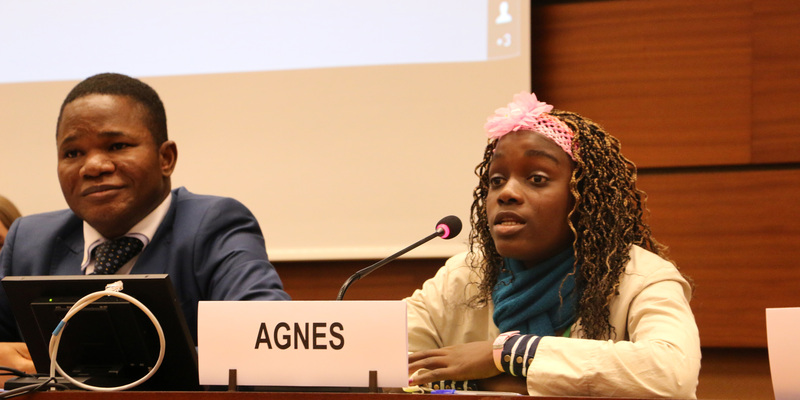 We all should be able to defend ourselves,” said Agnes. This has encouraged her to speak up on standards for quality alternative care. Haneen speaking in the panel discussion. Photo: Leonora Barclay. Haneen is a member of the Palestinian Children’s Council. She has campaigned for children without official documentation, including producing a brochure for schoolchildren to raise awareness of child rights and protection. Most recently, the Council where Haneen participates has been invited by the Ministry of Education to advise on the educational environment in schools. “The fact that we are here is proof of the love we received. I want to thank my SOS youth house and caregiver for the love they gave me,” said Haneen. SOS Children’s Villages believes that promoting and protecting child rights are a fundamental part of quality care. Every child has the right to quality care and continuous protection in a nurturing, empowering and positive care environment, whether they live with their family of origin or are in alternative care. Our commitment to quality care includes empowering children and young people to stand up as defenders of human rights. As part of our advocacy work, we encourage and support young people to have a voice and become active participants in decision-making processes. Main photo: Salimane Issifou, National Director of SOS Children’s Villages Benin, and Agnes at the panel discussion. Photo: Leonora Barclay.